Little Painted Nails: My Kids May Be Ungrateful Turds...and Happy New Year! My Kids May Be Ungrateful Turds...and Happy New Year! We have tried for years to be able to take our little crew to the land of Disney but for one reason or another we always came up a little short. Be it money or time or whatever else comes up it just hasn’t happened. Our concern has become that if we don’t do it soon, some of the magic might be lost for our eldest, Avery. 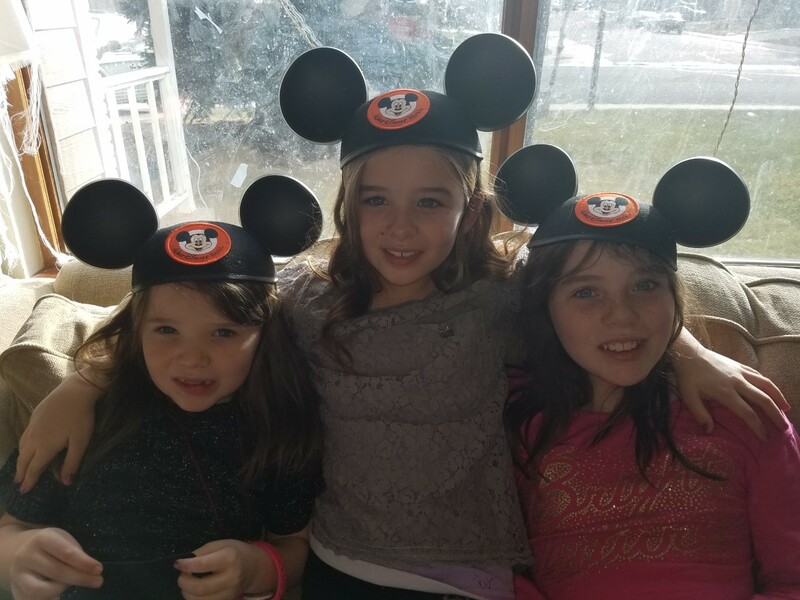 We decided, that for Christmas this year, we would bite the bullet and give the girls their long-anticipated trip to the ‘House of Mouse’. The trip won’t be until February, but we decided to give the girls the gift at Christmas so that the family could enjoy their receiving it and we could make a big to-do about it. The problem became the actual giving of the gift. We happened to have friends in Disney World in early December, so we had three of the stereotypical mouse ear hats made up with their names on the back of each one. We figured we would give them the hats and let them figure it out for themselves. Best laid plans of Mickey Mice and men. I came up with what I thought was a genius idea. We would elaborately decorate a large box with the hats inside but tell the girls that it was a gift for their grandfather, Poppy. Earlier in the Fall Poppy had given the girls his Nintendo Wii as theirs had crapped the proverbial bed. We told the girls that the box had a Wii in it and we would be giving it to Poppy after the last present had been given. The box was wrapped in loud purple wrapping paper and tons of bows. The girls loved the idea of giving Poppy a purple girlie box. The trap was set and the game was afoot. We began opening gifts, but the Disney gift was constantly scratching at the back of my head. Short of and engagement ring this was the biggest, priciest gift I had ever given. To say I was nervous would be an understatement. Perhaps not engagement ring giving nervous but nervous nonetheless. We finally got through the glut of gifts that had spilled out from under the tree onto the living room floor. We promise each other every year that the pile would be smaller. We had failed again. No matter, the gifts were open and the girls were excited. They ran into the next room to retrieve their prize. The y set it on their grandfathers lap and helped him tear into it. Adrienne filmed and I watched her fight back tears. They all tore tissue paper out of the box and revealed the hats. One by one they pulled them out of the box and put them on the appropriate heads. Macy seemed to get it a little, but was pretty reserved. Darby took one more cursory look in the box and was satisfied with the hat itself. She grabbed a tub of Pla-Doh and made her way into the kitchen. Avery looked confused. She lifted the last of the tissue paper from the box. She then mouthed to my wife and me, “Where’s the Wii?”. She was genuinely concerned about her Poppy not getting the gift they had been told about. Despite questions and prodding from the adults in the room, they never got all that excited. We never got the payoff we were looking for. Ugh. Later, after discussing in detail what was planned, they seemed to get it and get excited, but to be honest, it was too little too late. Both Adrienne and I spent the rest of the day feeling a touch hollow. As the next day moved along, it became obvious that the excitement of the trip was beginning to settle in. It was nice that they seemed to get excited but deep down, I wanted that moment of excitement when they realized what they had received initially. The lesson here ladies? This one is about me and perhaps your mother. While I admit that maybe you need to remember to be sufficiently grateful for what comes your way, the true lesson is for me. I truly try to live by the “better to give than to receive” idea. In that, it’s not at all fair for me to be upset when you don’t give the reaction I was looking for. That’s not the idea of gift giving, it’s a perk. At the same time, when the trip is over and the fun has been had, ‘thank yous’ will be in order. The goal of gift giving shouldn’t be to appear generous or magnanimous. It should be to simply try to give something to someone who may like or need it. The moment you consider their gratitude, you go from a charitable act to a quid-pro-quo one. I suppose the point of it all, the gift giving and such is to make someone else feel good and that should be reward enough. Tough to do, actually, I only bat about .300 on it. Very well written. I was completely taken off-guard by their reaction! !